The mildness of the Mediterranean climate makes it possible to cultivate a rich and varied vegetation such as olive trees, pines, cypresses, lavendar, laurels and tropical flora imported into the French Riviera during the 19th century. It was in the 19th century with the arrival of the English that palm trees were acclimatised on the Cote D’Azur and they have now become a symbol of the region. 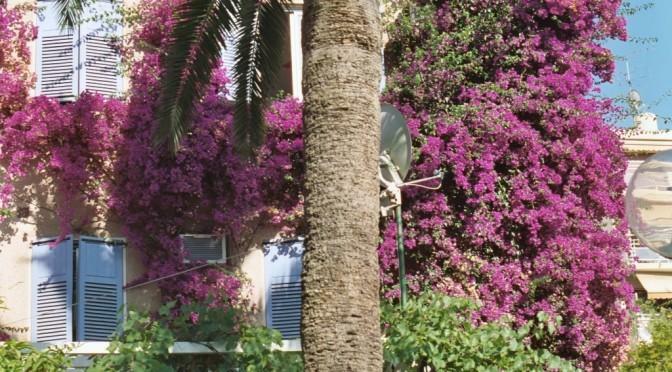 You will also see Gerbera, Carnations, Citrus trees, Cacti, Succulents, Aleppo Pines and of course Bougainvillea. Is the oldest garden in Nice and it’s gardens stretch for over 2km from the coast into the hills of the Cote D’Azur.